Many people have complained about Tolstoy’s lengthy epilogues for War & Peace, I for one found them fascinating and interesting. They tie up the book nicely, let the reader fill in the gaps and plot. After following the characters of the book for almost decade, Tolstoy jumps ahead another decade before beginning the epilogues proving once again that the only constant in life is change. While the characters are older, they are not wiser, still bumbling through life looking for answers which they will never get. One of the few characters which is content is Nikolai, and that is only because he doesn’t question life, but lives his life and takes on whatever is thrown at him. Even though Andrei is dead, his presence is felt through his young son. A happy ending – I think not! Actually, the epilogue 1 has some of the saddest part of the book. Epilogue 2 is an essay of the nature of free will. While not a particularly natural part of the story, the section certainly merits a read. 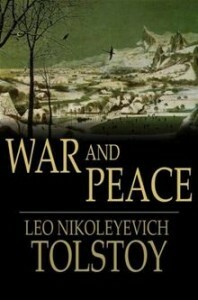 Tolstoy has many fascinating observations on human behavior, not only leaders but ordinary people as well. As a novelist, Tolstoy has some wonderfully interesting criticism of historians and great historical events. This is one part of the book which I actually laughed out loud and tremendously enjoyed. Old Count Rostov has died leaving his family in poverty and Nikolai, who has never run away from responsibilities, inherits the debts. Resigning his army commission, Nikolai moves to a small hose with the Countess and Sonya. Eventually Nikolai and Maria get married, even though Nikolai was almost imprisoned, and through hard work he manages to pay off the debts without resorting to selling Sonya’s property. The couple lives on Bald Hills, even though it brings back bad childhood memories to Maria, and Nikolai slowly buys back the old Rostov country estates. Pierre and Natasha got married. Natasha has gained a lot of weight and is jealous of her husband to the point where Denisov wonders what Pierre has seen in her. The Countess Rostov has lost all touch with reality while Sonya plays the role of a martyr. Andrei’s son, young Nikolai, is also in Bald Hills. However young Nikolai and his uncle, the elder Nikolai, don’t get along too well. Nikolai feels guilty because he doesn’t love his young nephew as much as he loves his children. However, everyone still loves Pierre. Pierre is involved with many reactionary and secret political movements who constantly question authority, Nikolai is thoroughly annoyed by this and says so quite bluntly. Soon Nikolai realizes that young Nikolai has heard the conversation and is unhappy since he believes that a young mind should not be faced with disrespect for authority. However, young Nikolai takes the side of his Uncle Pierre and says that his father, Andrei, would agree with them. Pierre knows that Andrei would not and walks away embarrassed. Young Nikolai builds his father up in his imagination to proportions which never were and is nothing like what Andrei has been. The son was not privy to the journey that the readers took with Andrei, his lust for glory, disillusions and wish for that great spiritual journey we call “death”. Young Nikolai dreams he is marching with his Uncle Pierre when suddenly Uncle Nikolai appears in a menacing manner.